Born in 1953 in Poznań. Graduate from the Faculty of Law and Administration of the Adam Mickiewicz University of Poznań (1975) and the Economy and Management Faculty of the University in Lund, Sweden (1989). In the years 1975-1977 Chairman of the Culture Committee of the Voivodeship Board of SZSP [Socialist Union of Polish Students] in Poznań, then a journalist, co-worker of “ITD” and “Student”, worker of the Theatre Centre “Maski” in Poznań. In the years 1980-1981 co-worker and then chief editor of “Wiadomości Dnia”, founder and chief editor of the weekly “Obserwator Wielkopolski” at the Board of the Region NSZZ [Independent and Self-governing Trade Union] Solidarność in Poznań. Interned on 13 December 1981 in Gdańsk, held in internment facilities in Strzebielnik, Gębarzewo and Ostrów Wielkopolski until July 1982. Unemployed in the years 1982-1984. In 1984 he emigrated with his family to Sweden. In the years 1985-1990 Chairman of the Swedish Committee of Supporting Solidarność. He studies and works as a journalist: co-worker of the Polish weekly “Nowiny” in Sweden, the Polish BBC section in London, the Polish section of the radio Stockholm. In the years 1989-1993 he was a consultant of Swedish companies, and in 1993 he returned to Poland as the director of Bulls Press, a Swedish media company. From 1995 - director of the Norwegian media company Orkla Media, president of the Board at Orkla Media Magazines Sp. z o.o. - printing house in Bydgoszcz, member of the Supervisory Board of the publisher Kresy Sp. z o.o. in Białystok. In the years 1999-2006 – President of the Board at Presspublica Sp. z o.o., publisher of the daily newspaper “Rzeczpospolita” and in the years 2004-2006, chief editor of “Rzeczpospolita". In the years 2000-2003 – president and from 2003 vice-president of the Chamber of Press Publishers. 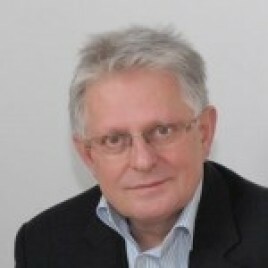 Vice-president of the Association of Authors and Publishers “Polish Book”, member of the Council of Information Order at the Warsaw Stock Exchange, member of the Programme Council of the Economic Forum in Krynica, member of the Polish Committee of Supporting the Construction of the "History Museum of Polish Jews". In 2005 he received a silver medal Gloria Artis. The director of the Book Institute since 2008.